First, let's define what a "Looper Boat" is. A Looper Boat is one which the owners plan to use to circumnavigate the eastern half of the United States and Canada. The voyage is between 5,500 to 7,000 miles plus or minus, depending on the route selected and is usually called the America's Great Loop Cruise. Sometimes it is also referred to as the Great Circle Route. A great deal has been written, and there are thousands of opinions, about what type, style, size (length, beam, draft, air height), types of engine(s), etc. that the ideal Looper Boat should have/be and how it should be equipped for such an adventurous pleasure craft cruise. The quick and safe answer is, that there ISN'T an ideal or perfect boat for doing the America's Great Loop Cruise. The Great Loop has been completed by almost every imaginable type of vessel from a personal water craft (PWC or Jet Ski®) to large luxury yachts both power and sail, gas and diesel. Keep in mind the limiting factors for air height, draft and beam, each listed separately in the specifications below. Along some of the Loop's waterways, a "big" boat is between 26 and 32 feet, has a beam of 8-1/2 to 11 feet and draft under 4 feet. So, mega yachts are not recommended nor are they needed. Equipping the boat for the Loop is another matter which we have addressed in several long-range cruising articles on our America's Great Loop Cruise "Smellin da Roses" web site, so we will limit this discussion to the vessel selection process and its amenities for individual lifestyles and cruising needs. Before deciding on a particular boat to do the Loop-whether to go with your present boat or sell it and buy something else-you must consider: (1) your lifestyle. (2) the Great Loop route you wish to take and, (3) how you will use the boat once you have completed the Loop. Do you like to be indoors or outdoors? Do you like to sit in a recliner with your feet up or sit up straight with your feet on the floor? Do you like to read books and/or magazines, or prefer to watch TV, look at movies, listen to radio, etc.? Is photography and writing a log of your voyage a priority? What about sending and receiving E-mail and going on the Internet? Do you enjoy sight seeing, visiting museums, shopping, etc.? Do you enjoy meeting people and making new friends? Do you prefer wilderness and nature and and their quiet solitude? Do you plan to cruise by yourselves or do you plan on having guests aboard for much of your trip? None of the answers to these questions are right and none are wrong: It is what's called different strokes for different folks, or why they make Chocolate, Vanilla, Strawberry and Moca-Nut-Banana-Coconut-Crunch! The route you choose can be affected by your desire to see and do it all, or it can be affected by a particular time frame. The full Loop includes the East Coast ICW, Chesapeake Bay, Jersey coast, Hudson River, Champlain Canal, Lake Champlain, Chambray & Richelieu Canals, Richelieu River, St. Lawrence Seaway, Rideau Waterway, 1000 Islands, Trent-Severn Waterway, North Channel, Great Lakes, Heartland Rivers, Tenn-Tom Waterway, Gulf ICW, Florida's Big Bend, Okeechobee Waterway, Florida Keys, and possibly the Bahamas, etc. The intermediate route includes the Erie Canal to Oswego, NY, Lake Ontario and the 1000 Islands, the Trent-Severn Waterway to the Georgian Bay and Lake Huron, etc. The short route omits the Lake Champlain and Rideau Waterways, the Trent Severn-Waterway and goes from the Hudson River via the Erie Canal to Lake Erie, Lake Huron, Lake Michigan and then down the Heartland Rivers to Mobile, Alabama, etc. Do you plan on continuing a long-range cruising lifestyle? Do you plan on becoming live aboards? Will your boat become a weekend and vacation get away? Will the boat become a floating condo? Or, will you do what lots of Loopers do; sell the boat and buy something more suited to your boating locale. If you have made a list of all the questions listed above with your answers, you are ready to move on to the next section of this article. If not, go back and do a self evaluation before continuing further. The point is, that most people do not change their likes or dislikes just because they start long-range cruising. We are all creatures of habit and will soon become miserable if we must change our lifestyle for the prolonged period of time that is required to complete the America's Great Loop Cruise-eight to 12 months or more. Few couples have lived in such a confined space of perhaps 12 feet by 35 feet for any appreciable period of time in their marriage. If nothing else, the Great Loop is the ultimate test of a couples compatibility and commitment to each other (You will learn more about each other than you ever imagined!). OK, let's get to the point of what makes an ideal or perfect boat in which to do the Great Loop. Let us rephrase that a bit by answering the question: "What to look for when deciding on a Looper Boat?" (1) Length: Ideally between 34 to 45 feet. Big enough for comfort, but not too big for the areas you will be cruising. (2) Air height (height above water): You must be able to clear 19 feet 1 inch to do the Loop (the absolute limit at Chicago, with a high-water pool level), but ideally under 17 feet for the Champlain route (charted at 15-1/2 feet for flood stage) and to go thru downtown Chicago. So, 15-1/2 to 16-1/2 feet is ideal. (3) Draft: 42 to 48 inches or less is ideal. Must be less than 60 inches on the Champlain route, 72 inches on the Heritage Canals, and you must sign a waiver if over 5-1/2 feet. (4) Beam: Under 14 feet if possible. 12-1/2 feet is ideal to fit into most boat slips; otherwise, expect to be on a T-head, if available. (5) House water capacity: 150 to 200 gallons is ideal (a minimum of 100 gallons). (6) Holding tank (black water) capacity: 40 to 80 gallons is ideal (minimum 30 gallons). (7) Electrical power: twin 30 amp versus one 50 amp. is recommended. Split on the boat from essential to non-essential (i.e. air conditioning as a non-essential on a separate circuit). Be prepared to live with a single 30 amp service and even one 15 amp service in a lot of places (buy one or two 30 amp female down to 15 amp male reducers). (8) Accessibility: the ability to get to both the bow and stern easily, with wide walkways and good access from the helm to both the port and starboard sides of the boat for locking purposes. (9) Anchors: two bow anchor system with both a Danforth and a Plow/Bruce anchor is ideal for the varying bottom types and/or for a twin 60 degree anchor placement. At least one anchor rode should have chain the length of the boat. (10) A good water filter system (charcoal and sediment for all water taken aboard) and also a Nature Pure or Sea Gull water purifier at least at the galley sink and also for the ice maker if so equipped. (11) If TV and video entertainment are important, consider a "marine" satellite TV antenna, VCR and DVD system for your boat (also recommended for Weather Channel). (12) Recommended is a large saloon with at least two recliner/lounge-type seats. Many trawlers only have an L-shaped seating around the galley table in a galley/saloon area which doesn't fit very many lifestyles from a living room comfort perspective. (13) A hard top bridge enclosure if possible (no need for a flying bridge). A pilothouse design with good side vision is ideal. If there is a canvas bridge enclosure, it should be as waterproof as possible unless the vessel has a lower station. A raised bridge or raised deck cruiser is also a good option versus a flying bridge. (14) Having a washer and dryer or combination unit aboard (110 volt if possible) is ideal. If not, have lots of quarters for marina/town facilities, when available. (15) Storage: The amount of storage is very important. The sheer volume of paper in the way of charts and guide books for the Loop is considerable. We actually shipped home charts and guide books along the way to gain more room (for gifts and souvenirs purchased). You can't bank on buying these navigation items along the way. Clothes, for hot, cool, and wet, take up a lot more room than normal summer boating wear. Food and staples supplies for a couple of weeks takes a lot more room than a week or two of cruising in your normal boating area where you know the locations of all the good stores and eateries. Cleaning supplies and all the extra gear and engine fluids stored in your dock box need to be taken aboard. Then there are the spare parts and engine manuals. Also, don't forget the office supplies such as a computer, printer, paper, envelopes, stamps, notebooks, pencils, pens, etc. (16) Have an innerspring mattress made for your stateroom bed. A wise investment over a foam rubber mattress, particularly on hot summer nights. A good night's sleep is paramount. Remember, the bed and pillow you sleep on aboard must be as comfortable as the one you left at home! (17) Last but certainly not least is the question of engine power. If your sole long-range cruising objective is to do the Great Loop and then become weekenders, occasional vacation cruisers or even snow birds, then the investment of an additional $75,000 to $100,000 or more for diesel engine(s) and generator may not be worth the added cost, and in fact might be an unwise investment for resale purposes. If on the other hand, you plan on selling the old homestead and becoming long-range cruising liveaboards, definitely go for the big diesels which you may be able to amortize over an 8- to-10-year period of cruising. Your boat will be your home for an extended period of time (8 to 12 months or more). Make sure you will be comfortable with your living conditions. If not, you and your crew will surely not get as much enjoyment as you should out of this boating experience of a lifetime. As we noted earlier, the perfect Looper Boat really doesn't exist. Life is all about compromises, so select a boat that fits your lifestyle and your needs, not what others think you should have. Go to the boat shows, go to Trawler Fests and AGLCA rendezvous and spend extra time at the "Trawler Crawls" and "Looper Boats." Buying the right boat for cruising the Loop is as important as buying a new home. Who knows, it may even become your new home! © 2006. Two J's Communications. All international rights reserved. 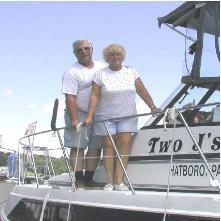 When John and Judy Gill cruised the Great Loop during the summers of 2002-04, they followed the Lake Champlain and Rideau Waterway route, thus, missing the Erie Canal. Since then, they chartered a canal barge boat to cruise the Erie and the Seneca-Cayuga canals. Next, they plan to charter a trawler out of Gore Bay on Manitoulin Island and to cruise the North Channel of Georgian Bay. The Gills did not visit the North Channel when on the Loop because of very low water in 2002 and because John's parents had a cottage near Sans Souci when he was a teen-ager. Their boat, Two J's V, is a 36-foot Carver Mariner which they berth at Sassafras Harbor Marina, Georgetown, Maryland. They are members of America's Great Loop Cruisers Association, Pennsway Power Squadron and USPS Life Members, Orillia Power Squadron, CPS-ECP. © 1997-2017 Water World Productions, formerly Trawler World Productions. All rights reserved. 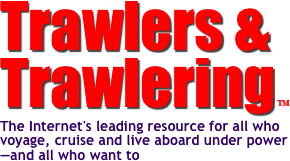 Reproduction of material from any trawlersandtrawlering.com page without written permission is strictly prohibited. Any copyrighted images remain the property of the copyright owner and are believed to be used with permission. Unsolicited letters, e-mails, articles and other materials submitted to us may be published, distributed and stored by Water World Productions and its assignees in whole or in part, in print or by any other means, including but not limited to electronic, and may be edited for clarity and space. Trawlers & Trawlering and its abbreviation T&T, I'd Rather Be Trawlering, Passagemaking Under Power and its abbreviation PUP, Trawler Buy-Sell-Trade, Trawler News, Circumnavigator, and Power Catamaran World are trademarks of Water World Productions. JOIN A TRAWLER FORUM TODAY!